Keiro resident Bette Uchida and Jewish Home resident Lucille Weiss clink glasses during the Passover Seder, held at Keiro Retirement Home in celebration of the Jewish Home’s centennial. 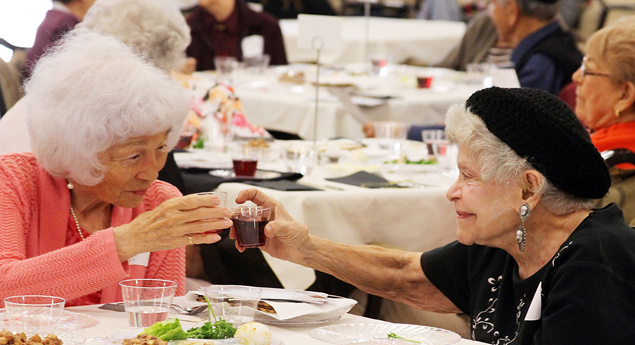 Residents, administration, board members, dignitaries and staff of Keiro Senior HealthCare and the Los Angeles Jewish Home participated in a traditional Passover Seder in celebration of the Jewish Home’s centennial. The cross-cultural event was held Monday in the Koichi and Toyo Nerio Dining Room at Keiro Retirement Home in Boyle Heights. Jewish and Japanese seniors partook in traditional Passover Seder foods such as matzah, boiled egg, and bitter herbs to mark the ancient Jewish exodus out of Egypt. They sang Passover songs and participated in the telling of the Passover story led by Rabbi Anthony Elman, Skirball director of spiritual life at the Jewish Home. Clockwise from top left: Shawn Miyake, president and CEO of Keiro Senior HealthCare; Annette Shapiro, Jewish Home centennial chair; 99-year-old Masako Wada, wife of Keiro co-founder Fred Wada; 100-year-old Jewish Home resident Ella Kalan. Keiro residents also shared their culture by serving a traditional bento box lunch of marinated cod, sushi, edamame, fruit, and rice. The event marked a “returning home” for the Jewish Home and an opportunity for Keiro to thank the organization for making it possible for Keiro to purchase the property and serve the growing needs of the Japanese American senior community. The Jewish Home was founded 100 years ago on the property that today includes Keiro Retirement Home and Keiro Intermediate Care Facility, as well as administrative offices for Keiro Senior HealthCare and The Institute for Healthy Aging. The Jewish Home began when members of the Boyle Heights Jewish community hosted a Passover Seder for five elderly men from what was then called the County Poor Farm. In 1974, when the Jewish Home moved to Reseda, it sold the property to Keiro, where the tradition of caring continues. The two organizations have remained in contact ever since. “The Jewish community was instrumental in establishing our first retirement home for Japanese,” said Shawn Miyake, president and CEO of Keiro Senior HealthCare, who noted that the Jewish Home left Keiro its medical equipment and lent Keiro $150,000, interest-free, to help with initial operations. 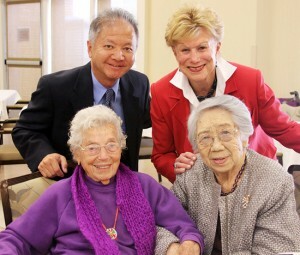 Masako Wada, 99, wife of Keiro co-founder Fred Wada, also participated in the Seder event. She and her husband were out driving when they noticed the “for sale” sign on the Boyle Heights property, now home to approximately 250 Keiro residents. Hosting the Seder also provided an opportunity for Keiro residents to engage in lifelong learning, expand friendships, and share in meaningful ways that enhance their quality of life. According to Fujie Wade, president of the Keiro Retirement Home Residents’ Council, Keiro residents also diligently researched Passover on the Internet in preparation for hosting this event.